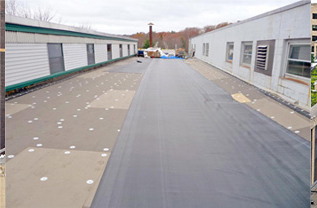 EPDM roofs use a Terpolymer is a product consisting of three distinct monomers; Ethylene Propylene Diene Monomer. EPDM roofs are single-ply membrane roofs; there is only single ply of roofing material, not multiple plies laminated together. It is one of the most common types of low-slope roofing materials, it is relatively economical, easy to install and clean to work as compared to conventional built-up roofs. Flat roofing is designed to be cost effective and faster than traditional roofing systems. It is resistant to the effects of ozone, UV and infrared radiation. It is preferable to other roofs as it is highly slip resistant when wet. It is recyclable and ideal for green roof installations.